We ate a very good breakfast at the hotel this morning. While eating, we met a family that was driving around Colorado, visiting popular tourist destinations. The father was so impressed with our trip that he went out of his way to introduce me to his daughter. She seemed annoyed to be awake so early. We checked out and rode to the Wal-Mart to resupply. The weather was amazing compared to yesterday – clear, cool, and sunny. On our way out of the store, as I packed too much food into my panniers, a group of middle-aged male road cyclists came and asked about our trip. Thinking in terms of road cycling, they thought our 50 to 60 mile days were short. They did not realize how much more difficult it is to ride that distance on dirt roads with 45+ pounds of food, water, and gear. We left and headed for the business district where there would be bicycle shops. 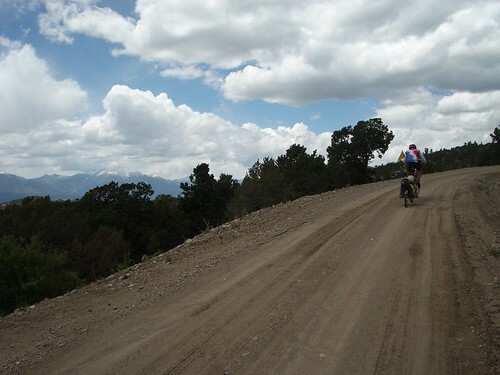 As we cycled there, a roadie passed us and welcomed us to Salida. I was starting to like this town already. There were people riding all kinds of bikes around town – commuter, road, and mountain bikes. I definitely felt a bike-friendly vibe. It took a while to find the Absolute Bikes in the maze of streets. When we found it, I bought a tire boot (for patching that tear in my outer tire) and four spare tubes. I applied the boot to the rear tire and replaced the patched tubes with fresh ones. Auke ordered a new tire (to replace one that was significantly worn out) and had it shipped ahead on the route. Mathieu upgraded one of his brakes from 160 mm to 180 mm rotors – more stopping power. 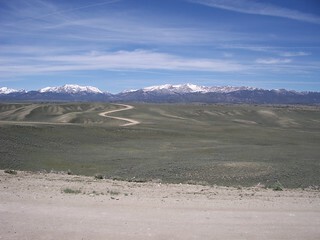 We left Salida around 11:00 and had a huge climb out of the valley. On the start of the climb, a mountain biker rode next to me. We chatted about the town, my lack of experience riding in mountains, and our trip. I was riding at 100% effort while he easily paralleled me. When cars passed us, he easily sprinted ahead to make more room for them. I soon became too exhausted to continue with the other rider, but did not want to stop. I pushed another 5 minutes before finally giving in to my legs’ desire to rest. “I have to put a foot down” was how I announced it. My temporary riding partner said he’d be thinking of us and seemingly sprinted up the mountain. I rested while Mathieu and Auke caught up. They were smart to have taken it slower. 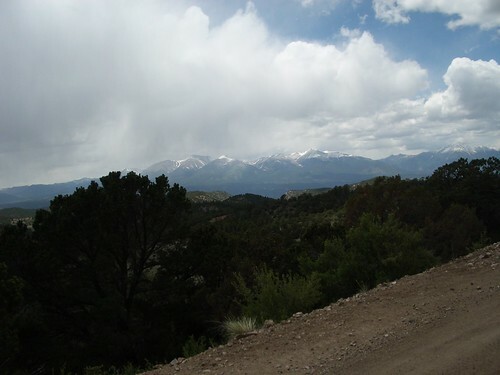 I was alone for the rest of this portion of the climb from Salida…and I was exhausted. I stopped multiple times to regain some strength and catch my breath. By the time I met with Mathieu and Auke, it was past 12:30 and I was getting hungry. I told them and hinted at eating once we crested the upcoming watershed divide. It was another slow haul to get there. While I climbed, it began snowing! It was very cold at the top of the divide, so we did not eat there. We coldly descended through a rocky forest into high plains. The descent leveled and became short rolling hills. Rain from the past days made the road very muddy in places. It stuck to our tires, made our chains gritty and noisy, and sucked away at my energy. By the time the mud section ended, Mathieu and Auke were far ahead of me. It was nearly 15:00 and I still hadn’t eaten. At each turn and hill, I hoped to see them stopped so I could have a meal. It wasn’t until 16:30 that I saw them stopped ahead. During the 5 minute ride to them, I thought of what to say. I wanted to express my frustration without sounding whiney. Afterall, I had been riding 4 hours past being ready to eat. Once I reached my partners I said, “I’m going to eat.” No question. No complaint. No stopping me. It turned out that Mathieu and Auke had eaten while waiting at the watershed divide and assumed I had a meal before the top. Now, it was 17:00 and we had another 20-some miles to Hartsel. I was tired, frustrated, and low on water (and none to be found). There were storms building all around us. The situation did not look good. The road was generally downhill and we had a slight tailwind to make the miles easier. Naturally, though, the roads were very washboarded at times. I finally rolled onto pavement, then into Hartsel. I found two familiar bikes outside the town’s restaurant. I went in and ate two turkey sandwiches and hot coffee. After talking to Rick, our server, I found out he is a Chicago native like me. He lived in Wilmette and went to New Trier High School (class of ‘53) – then and now my high school’s biggest rival. The schools are not even two miles apart. Rick landed in Hartsel in his early 20’s and never left – except to move out of Chicago and tell his parents goodbye. 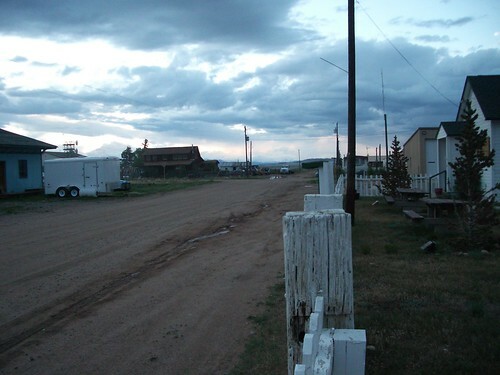 Our maps indicated there are no overnight accommodations available in Hartsel, so we were taking a risk ending our day here. It paid off, though. 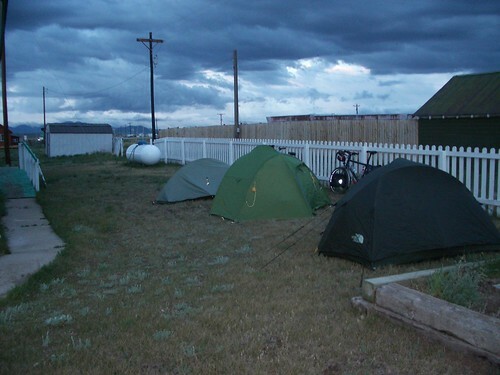 Rick is the Mayor of Hartsel (he claims) and said we could camp in the schoolyard. We set up camp right next to a sign saying camping was not allowed. The temperature dropped quickly making us hurry into our warm sleeping bags.